If we want to draw readers into our story, we need a great beginning. If we can make our readers’ mouths drop open with a great opening paragraph, and if they love the first chapter, we have a good chance that we will keep them for the rest of the book! Craft your first sentence and first paragraph carefully, with the intention of gripping your readers right from the start. Giving a teaser is a great idea, to draw your readers in. 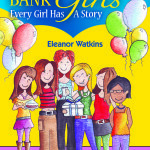 For example, here’s the first sentence from Beech Bank Girls, Every Girl Has A Story by Eleanor Watkins*: “I didn’t really expect to enjoy the first day at my new school, Beechwood High, and I was right.” Immediately readers will want to know who is saying this, why, and what happened. There’s an element of intrigue. Start with action – you can reveal any ‘back story’ later. Here’s an example of a dull beginning: your main character sitting at a table eating dinner discussing church with his or her family. You need to start with something exciting happening. Make your first chapter full of tension and drama – bring in the conflict. In the Beech Bank Girls book mentioned above, Annie is fearful of being bullied, and we see her fears and the way this expresses itself through her experiences at her first day at school. Bring in emotion from the very word go. If you are writing a creepy story, bring in that atmosphere. The same goes for any emotion – excitement, mystery, drama, fear . . .
Introduce us to the main character/s, and let us know what they are like by the way they act or speak. And make us feel for them. Anyone who has seen bullies at work will totally identify with Annie by the end of chapter one of the Beech Bank Girls. And readers will want to know what happens to her, because they care.